“Papa Francisco” redirects here. For the sports club, see Club Deportivo Papa Francisco. 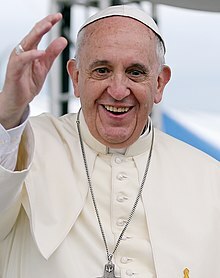 Pope Francis (Latin: Franciscus; Italian: Francesco; born Jorge Mario Bergoglio,[b] 17 December 1936) is the 266th and current Pope of the Catholic Church, a title he holds ex officio as Bishop of Rome, and Sovereign of the Vatican City. Born in Buenos Aires, Argentina, Bergoglio worked briefly as a chemical technician and nightclub bouncer before beginning seminary studies. He was ordained a Catholic priest in 1969 and from 1973 to 1979 was Argentina’s provincial superior of the Society of Jesus. He was accused of handing two priests to the National Reorganization Process during the Dirty War, but the lawsuit was ultimately dismissed. He became the Archbishop of Buenos Aires in 1998 and was created a cardinal in 2001 by Pope John Paul II. He led the Argentine Church during the December 2001 riots in Argentina, and the administrations of Néstor Kirchner and Cristina Fernández de Kirchner considered him a political rival. Following the resignation of Pope Benedict XVI on 28 February 2013, a papal conclave elected Bergoglio as his successor on 13 March. He chose Francis as his papal name in honor of Saint Francis of Assisi. Francis is the first Jesuit pope, the first from the Americas, the first from the Southern Hemisphere and the first non-European pope since the Syrian Gregory III in 741. Throughout his public life, Pope Francis has been noted for his humility, his concern for the poor, and his commitment to interfaith dialogue. He is known for having a humble approach to the papacy, less formal than his predecessors, for instance choosing to reside in the Domus Sanctae Marthae guesthouse rather than the papal apartments of the Apostolic Palace used by his predecessors. In addition, due to both his Jesuit and Ignatian aesthetic, he is known for favoring simpler vestments void of ornamentation, including refusing the traditional papal mozzetta cape upon his election, choosing silver instead of gold for his piscatory ring, and keeping the same pectoral cross he had when he was cardinal. He maintains that the Church should be more open and welcoming. Although he considers poverty a huge problem, he does not support unbridled capitalism, Marxism, or Marxist versions of liberation theology. Francis made the battle against global warming, consumerism, and irresponsible development a focus of his papacy with the publication of Laudato si’. The media considers him a progressive papal reformer, with a less-doctrinal tone of papacy. Despite this, Francis maintains the traditional views of the church regarding homosexuality, abortion, ordination of women, and priestly celibacy. In international diplomacy, he helped to restore full diplomatic relations between the U.S. and Cuba.